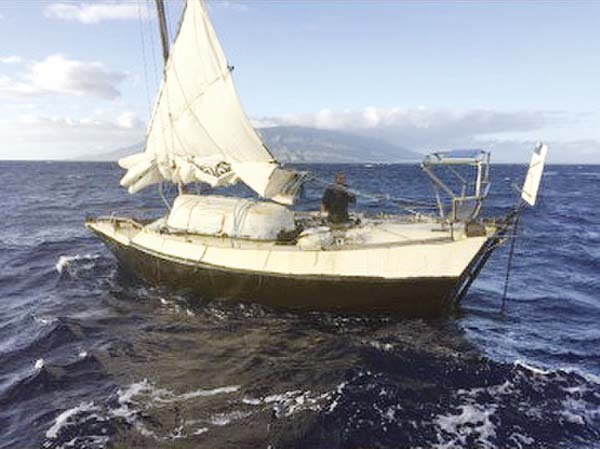 The U.S. Coast Guard and a good Samaritan towed an Australian mariner and his homemade sailing vessel to safety Sunday after the man became disoriented 3¢ miles west of Maui, the Coast Guard said. At 3 p.m. Sunday, Maui Coast Guard officials received a report from the operator of the commercial passenger vessel Trilogy V that the master of the 30-foot sailing vessel Kehaar Darwin had flagged him down, asking for assistance. The 62-year-old Australian man aboard the Kehaar Darwin was reportedly disoriented and having trouble making it into port. He departed Panama about 104 days earlier en route to Australia before weather conditions forced him into Hawaiian waters. He was without communications equipment and an engine, and his sails were in poor condition. Weather on the scene was reportedly 17 to 23 mph winds with seas to 4 feet. A 45-foot Coast Guard rescue boat from Maui safely towed the vessel to Sugar Beach. Customs and border protection officials will interview the mariner before he resumes his voyage. The Coast Guard strongly recommends all mariners ensure they have proper safety gear aboard their vessel prior to departure. Properly fitting life jackets, a VHF radio or some form of communication and signaling devices are examples of safety gear that can mean the difference between life and death in an emergency. The Coast Guard strongly recommends that all mariners file a float plan with a friend or family member, with an approximate time of return and route. Mariners should check in regularly, especially if plans change. Mariners should check current and forecasted weather conditions before getting underway and remain aware of changing conditions while sailing.